He has been called the modern Darwin. He often spends months in the jungle collecting lizard specimens with nooses made of floss. 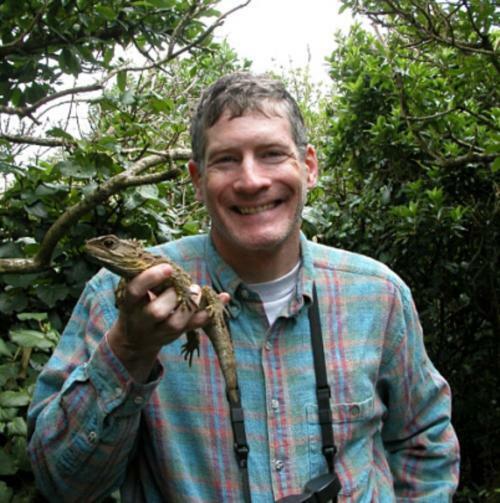 He has been challenged by The National Enquirer.He is Harvard Herpetologist Jonathan B. Losos ’84. Through decades of fieldwork in remote Caribbean islands, the St. Louis native has successfully charted the evolution of multiple species of lizards in real time. By conducting rigorous biological and behavioral analyses of animals on tiny islands that are repeatedly devastated by hurricanes, Losos has produced some of the only empirical scientific evidence documenting evolution. In fact, Losos has proven that evolution can occur very rapidly and that lizards will adapt to different environments at observable speeds. Thus, according to his research, evolutionary biology can be an experimental science. Losos has published about 125 scientific articles—over a dozen in just the journals Nature and Science—and his first book “Lizards and an Evolutionary Tree,” comes out next month, according to his father Joseph O. Losos ’52. Though to the public Jonathan Losos may be known only as an evolutionary biology rock star, students applaud his calm temperament and commitment: four years ago, he took his freshmen seminar students on an all-expense-paid field study to Puerto Rico, where he was dubbed “Indiana Jones” after sporting a wide brimmed hat and rolling under beds to catch loose specimens. And though he has not taken a traditional career path—he once considered applying to law school—family members say they could scarcely imagine him doing anything else. Losos harbored an obsession with dinosaurs as a toddler, and he soon became obsessed with modern reptiles and “all sorts of scaly things,” said his sister Louise W. Losos ’90. According to family lore, Jonathan Losos begged his parents for a pet reptile after watching a classic “Leave it to Beaver” episode at age 11 or 12—in which the title character obtains an alligator—and would not relent until his parents agreed to meet their family friend, the director of the St. Louis Zoo, to discuss the prospect of housing two caimans in the family basement. Much to his parents’ chagrin, the zoo director thought housing the small crocodiles was a wonderful idea: the director’s reptilian childhood pets had piqued his own interest in zoology. Losos’ adored his caimans, according to his father, and joined the St. Louis Herpetology society at age 12. “He was probably their youngest member,” said his father. When it was time for Jonathan to leave for college, the caimans had swelled to a full two and a half feet. Losos decided to donate his prized pets to the St. Louis Zoo, where he had volunteered every summer. Even outside of St. Louis, Losos insisted that reptiles play an integral role on every family vacation—or he would refuse to attend. On a trip to Sri Lanka, when Losos was a senior in high school, the family had a layover in Paris. While the rest of the family went to historical sites in the city, Losos went to the zoo. Though he frequents the Bahamas for his field research, his sister said that he spends no time sunning himself on the beach. Thus, it is a family joke that Lasos was the subject of a National Enquirer inquiry into government-sponsored luxury vacations parading as cushy research grants. “He had the article up on his refrigerator for a long time,” said his eldest sister, Elizabeth Losos ’85. Harboring a lifelong penchant for rugged terrain, Losos first discovered field work in Jamaica while working on-site collecting lizard specimens for a Harvard graduate student after his sophomore year in college. And conducting field work in the Caribbean would be one of many college forays that would be repeated once he returned to Harvard over twenty years later as an esteemed professor. Freshman year, Losos took an evolutionary biology course taught by celebrated biologist Edward O. Wilson that would convince him to pursue his passion in organismic biology. Losos now teaches that same course, with an updated syllabus. —Staff writer Laura G. Mirviss can be reached at lmirviss@fas.harvard.edu.